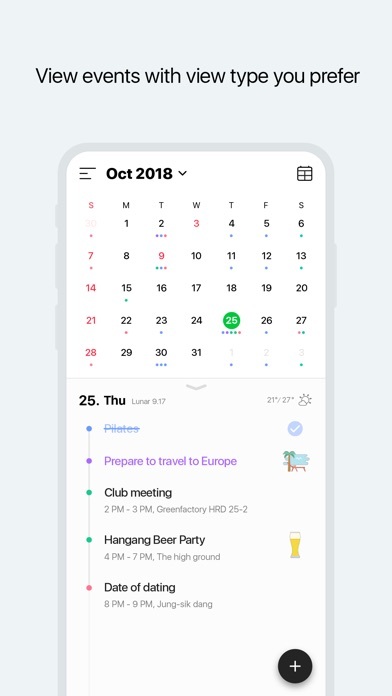 Have fun planning your day with the NAVER Calendar App - A simpler and refreshing design - View schedule in a view-type of your choice (Weekly and dual view added) - 700 free stickers - Weather information, Smart Briefing - Supports iPad ※ Updated Calendar app (v4.1.2) is available in iOS 10.0 and after. [Key Features] 1. Schedule, anniversary and to-do, managing all at once! Easily manage your daily to-dos, let alone the schedules that you need to keep track of. Don’t be stressed out about confusing lunar calendar anniversary that changes every year. Leave everything up to NAVER Calendar! 2. Alerts that ring at the right time & moment Register easily-forgettable anniversaries to your calendar and it will help you to keep track of lunar calendar anniversaries on the right day. 3. Single touch to compose schedule! Tap and hold dates on Monthly, Dual or Weekly-view to register schedule, to-do and anniversary. 4. View schedules in a view-type of your choice Set your calendar in the monthly view to see all your schedules for the month, or in the weekly view for the week. You can also fix your calendar in the list-view for daily schedules or the time-view to manage your schedules hourly. 5. 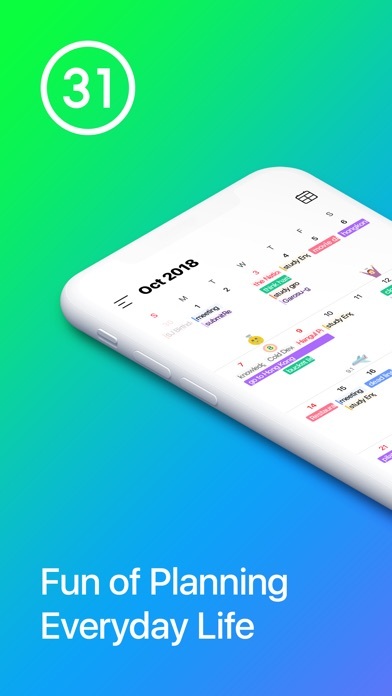 Shifting calendar If you swipe the screen left and right in the monthly view, you can see the previous or the next month. 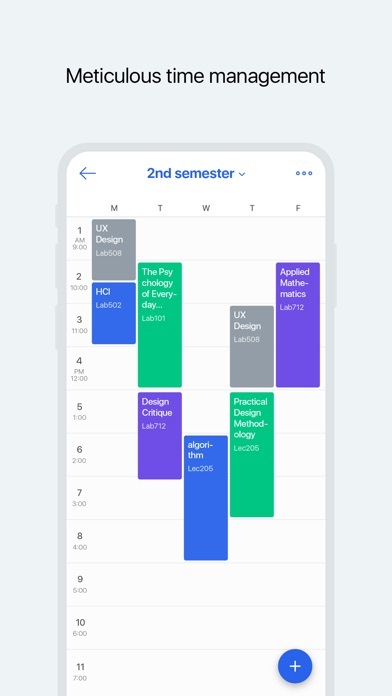 If you swipe upward, you can see detailed schedules with the calendar. 6. Exciting stickers and category setting You can categorize each schedule/ anniversary type with different colors for a convenient use and give uniqueness to your schedule with various stickers. 7. Weather information Check weekly weather forecast in Weekly view and see current weather condition in daily view. 8. 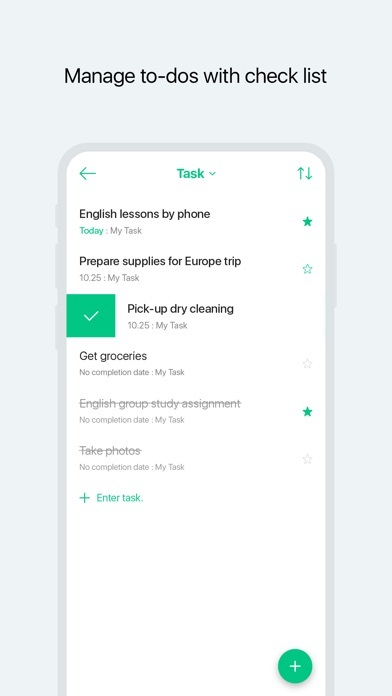 Manage to-dos simply with checklist Swipe to right to handle a to-do as completed and left to delete! You can easily create to-do group as well! 9. Anniversary Don’t forget approaching anniversary with D-day. Your everyday will become more special. 10. 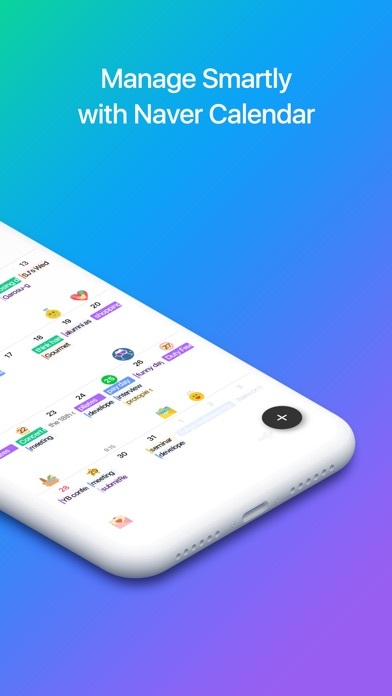 Managing together: shared calendar You can co-manage your calendar with members including your friends, lover, family members and colleagues by sharing. 11. Time-table Time table is a must-have item for students and moms. 12. Easy-sync with other calendars You can simply import schedules in default calendar of your phone with a single click. 13. Support different time zones When you are abroad or scheduling with friends in overseas, you can simply adjust the time zone to register the schedule. ■ Details of mandatory access rights - Location: Depending on your current location, you can use the weather function at monthly view and weekly view. - Calendar: You can import events saved in the device and save them to NAVER Calendar. Should you face any problem or inquiries while using the app, please contact NAVER Calendar Customer Service Center (https://m.help.naver.com/support/service/main.nhn?serviceNo=5620). 왜 업데이트 시켜서 하얀 배경으로 했는지..? Why change the color scheme? 잘 사용 했는데 요즘엔 덜 사용하게 된다 I used to use more when it was colorful 기능엔 전혀 문제 없다 The function has always been good 디자인 돌려다오! Please revert it back to the previous design! 스킵도 안되고 급한데 일정확인할때 개짜증나게해놧네 그리고 제정신이면 캔슬버튼 오른쪽에놔라 업데이트한놈 왼손잡이냐? 아이폰 내 달력과 달리 네이버달력은 여전히 31일만 보여주고 있는데, 오늘 날짜로 보여주는 것이 어렵나요? Cant enjoy the app because it takes too much to set up! Username requires letters, special characters, and a number. Wants to know your birthday, which is required for sign up! And your phone number is required for sign up for a text verification code! I sincerely FEEL like NONE of this is really necessary for creating a calendar! Its not facebook, or twitter, or social media! 갑자기 할머니 할아버지 생신이 사라져서 다시 입력하려고 보니 33년 이전 생신이신 분들은 날짜 선택조차 불가능하게 설정되어 있네요. 입력도 못하고, 있던 저장 기념일에서도 사라지고.. 지금까지 만족스럽게 잘 쓰고 있다가 너무 황당하고 서글퍼지네요... 백세시대에 90도 안되신 분들 세상 사람 아닌 취급하는 것 같아 불쾌하네요. I like the calendar, but the timetables do not work. When you go to add a class it does not appear on the table after you have confirmed it. Please fix, I really want to use that function.